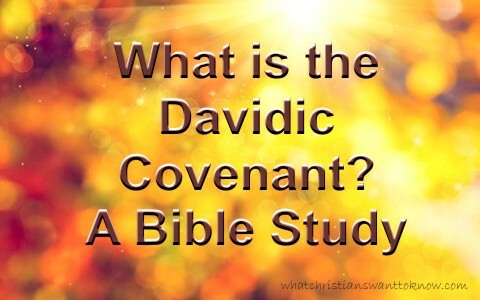 Have you ever heard of the Davidic Covenant? If so, what is it? If not, then what does the Bible say about the Davidic Covenant? The Davidic Covenant refers to the promise that God made to David and is mentioned in 2 Samuel 7:11b-13 “the Lord declares to you that the Lord will make you a house. When your days are fulfilled and you lie down with your fathers, I will raise up your offspring after you, who shall come from your body, and I will establish his kingdom. He shall build a house for my name, and I will establish the throne of his kingdom forever.” Clearly this is referring to David’s offspring from which Jesus Christ comes because His kingdom will be established forever because it’s not possible that any human could ever have his kingdom established forever. When David died, Solomon was dedicating the temple of the Lord and prayed to God “O Lord, God of Israel, keep for your servant David my father what you have promised him, saying, ‘You shall not lack a man to sit before me on the throne of Israel” (2 Chro 6:16a) which indicates that Solomon also knew about this covenant that God had made with David. Even in Jesus’ day many understood that He was the promised Son of David which is why “the crowds that went before him and that followed him were shouting, ‘Hosanna to the Son of David! Blessed is he who comes in the name of the Lord! Hosanna in the highest’” (Matt 21:9). As we have already read, we know that Jesus is descended from the House of David. Jeremiah foretold that “the days are coming, declares the Lord, when I will raise up for David a righteous Branch, and he shall reign as king and deal wisely, and shall execute justice and righteousness in the land. In his days Judah will be saved, and Israel will dwell securely. And this is the name by which he will be called: ‘The Lord is our righteousness” (Jer 23:5-6). Jesus is the One Who had the “key of David” (Rev 3:7) who it was said of “He will be great and will be called the Son of the Most High. And the Lord God will give to him the throne of his father David, and he will reign over the house of Jacob forever, and of his kingdom there will be no end” (Luke 1:32-33). Zechariah prophesied about Christ “Blessed be the Lord God of Israel, for he has visited and redeemed his people and has raised up a horn of salvation for us in the house of his servant David, as he spoke by the mouth of his holy prophets from of old, that we should be saved from our enemies” (Luke 1:68-71). Isaiah also prophesied of the coming King of kings and Lord of Lords declaring “For to us a child is born, to us a son is given; and the government shall be upon his shoulder, and his name shall be called Wonderful Counselor, Mighty God, Everlasting Father, Prince of Peace. Of the increase of his government and of peace there will be no end, on the throne of David and over his kingdom, to establish it and to uphold it with justice and with righteousness from this time forth and forevermore” (Isaiah 9:6-7). This King will have the power and authority to establish peace and broad enough shoulders to have the government be upon Him, and the kingdom that He reigns over will have no end and His righteous government will forever increase. When the blind man Bartimaeus knew that Jesus was coming, he cried out “Jesus, Son of David, have mercy on me!” and even though “Many rebuked him and told him to be quiet, but he shouted all the more, ‘Son of David, have mercy on me’” (Mark 10:47-48)! Today, Jesus is still having mercy upon those who call out His Name (Rom 10:9-13) and there is no other name in all the universe where we must be saved (Acts 4:12). Even the blind man knew that Jesus came as the Seed of David and that this God-Man could heal the lame, raise the dead, and make the blind to see. Today, many who refuse to see are blinded by the god of this world (2 Cor 4:4) but none are as blind as those who don’t want to see. None are as hardened as those who reject the Lord. There is no hope for those who refuse to repent and turn to Christ in faith. Jesus Himself said of those, “you would die in your sins, for unless you believe that I am he you will die in your sins” (John 8:24) for “whoever rejects the Son will not see life, for God’s wrath remains on them” (John 3:36b) but “Whoever believes in the Son has eternal life” (John 3:36a). Read about another promise here: What is the Abrahamic Covenant? Next post: What is a Fivefold Ministry?